OMG! The Spectras Are Back on B&B! Get the Delicious Details! Fans of the “Bold and the Beautiful” (B&B) are in for a “red awakening.” And you’re going to love it! We at Soap Cities were intrigued but slightly bewildered by Eric’s (John McCook) Sally Spectra-related flashback on “Bold and the Beautiful” the other day. Then our jobs pretty much fell to the floor when someone named “Sally Spectra” signed a check today! “The new Sally we just met on air is the original Sally’s grandniece and Shirley’s [Sally’s sister] granddaughter,” Bradley Bell, B&B head writer and Executive Producer told tvinsider.com. There will be a whole new “Spectra gang,” Bell said. Shirley–to be played by the enchanting Patrika D’arbo–the new Sally [Sally II, let’s call her]; Sally II’s daughter; and Sally I’s late tailor Saul’s son will all be mixing it up in La La Land. These four are ready to claw their way to the top of the fashion heap. And yes, they do know that would be mean dethroning the Fabulous Forresters. There will be two more Spectra-related additions. C.J., Sally’s son and Rick’s (Jacob Young) childhood BFF will be back on the scene. The new version of Sally’s assistant, Darla, will be Darlita. 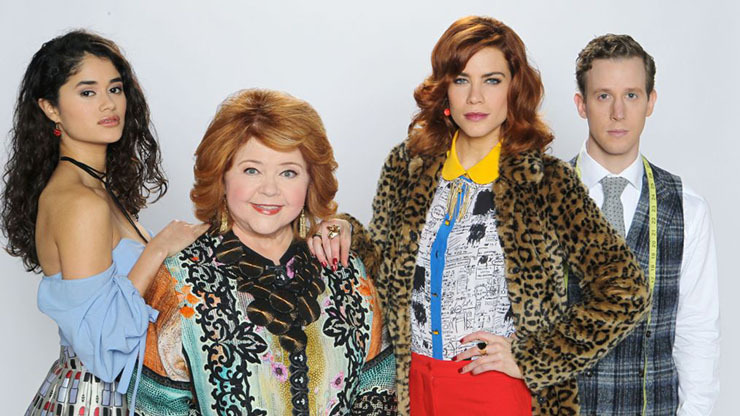 “They will definitely play dirty,” Bell said of Shirley and Sally II, which is sure to influence the new Spectra gang as a whole. “Even though we lost Darlene [Conley, Sally Spectra], I always felt the character was bigger than life and that she should live forever. And she will. She’s still out there somewhere—traveling to exotic places, having her cocktails, surrounded by her boy toys. And we’ve come up with some cool ways to make her a part of this new story,” Bell said. This brought a tear to our collective eye at Soap Cities. And then we smiled upon reading Bell’s observation about the Forresters vs. the Spectras. “The Forresters are champagne. Spectra and her gang are wine in a box,” Bell said. It looks like there will be a lot more crying and laughter our B&B viewing futures! We at Soap Cities knew this was coming also. Previous ArticleB&B Feb Sweeps: A Forrester/Avant Wedding?